There is something of a futuristic tech angle about this edition of The Next Small Cap — a pathway to capitalising on the newly emerging paradigm shift built on lithium-ion batteries. A plucky ASX company with the most mythological of names , is taking the prescribed steps to transform the lithium myth into a commercial reality for its shareholders. 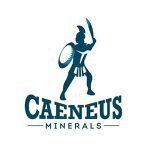 Caeneus Minerals (ASX: CAD) has pencilled in an audacious market plan to sandwich itself into one of the most active lithium hotspots in the world, in the epicentre of Nevada. And following a slew of high impact acquisitions prospective for both lithium brines and clays, the company may have pulled off their best move yet, with the recently announced acquisition of the New King Lithium Clay Project . The New King Property claims have excellent nearology, situated in a similar geological setting to Lithium Americas Corp’s (TSX: LAC) Lithium Nevada (formerly Kings Valley) Project which contains one of the largest undeveloped lithium deposits in North America. New King directly abuts the Lithium Nevada Project, with minerals lying to the east and north of New King. New King also has strategic relevance being just 350km from the Tesla Gigafactory. In fact Nevada in general is currently the staging area of the global lithium revolution; and it is all to do with Tesla and Elon Musk’s plan to literally disrupt the world via improved energy storage. Already, Tesla’s electric vehicles (EVs) have captivated the imagination of US consumers by becoming the best-selling US automobile — even when competing with combustible engines. Tesla has already begun to sign a trickle of offtake agreements , as the company gradually builds up steam and production capacity. Market consensus is now in alignment that Tesla is likely to offtake a whole lot more lithium specifically from local lithium producers, while the bigger global picture includes Chinese EV manufacturers who are also positioning for the EV car changeover. There is no guarantee that CAD will be part of this offtake process, it is early days for this stock and anything can happen. So when considering CAD for your portfolio take into account all public information and seek professional financial advice. For the first time in history, electric cars may soon have the edge over their fossil-fuel-guzzling ‘sistren’ and this likely means lithium-ion batteries have the green light to be produced en masse in order to supply not only Tesla, but also other EV hopefuls from around the world. With the global markets continuing to validate the shift to battery-powered energy storage, the market landscape now looks lush and picturesque for CAD as well as other lithium explorers in Nevada and beyond. 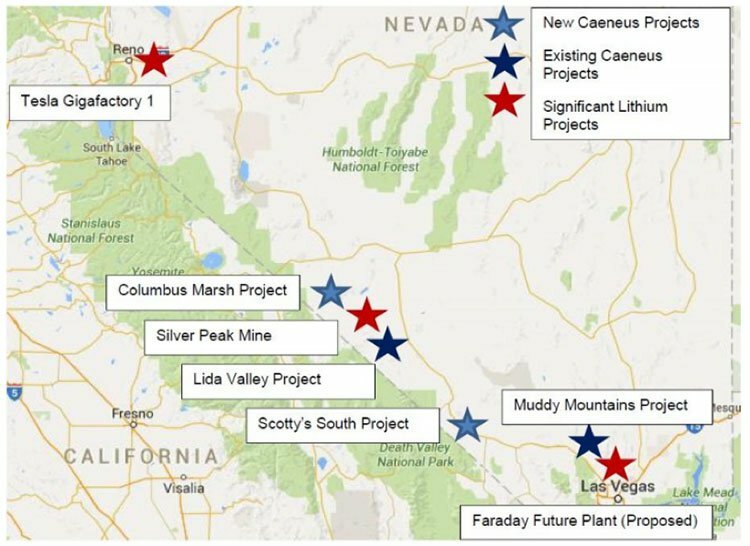 CAD has claimed exploration ground in three of the best emerging lithium-brine basins in Nevada: Lida Valley, Sarcobatus Flats and Columbus Marsh, as well as two potential ‘district scale’ lithium-clay projects: Muddy Mountains and New King. CAD Managing Director Steve Elliott recently returned from Nevada where he met with the geological team in order to plan the upcoming exploration programs, and undertook further due diligence on the recently acquired Scotty’s South Sarcobatus Flats and Columbus March Lithium Brine Projects. 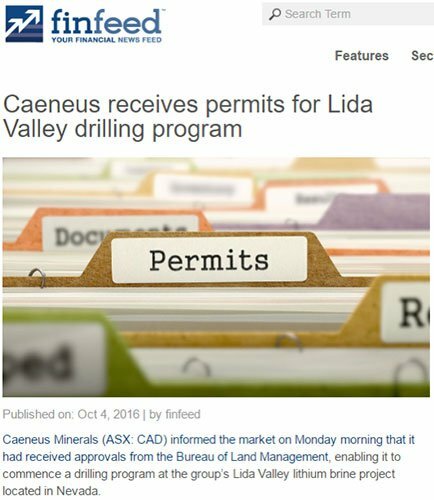 CAD announced on 3 October 2016 that it had received the drilling permits from the US Bureau of Land Management to explore for brines on its Lida Valley Project. and the company will start drilling in due course – the first program to consist of five holes, drilled to depths of up to 300 metres. CAD’s objective is to become one of the foremost companies in the Nevada lithium exploration and development sector and its acquisition strategy puts it well on the path to reach its goals. It’s still early days for CAD and its explosive lithium dream, which is why we’re here to keep you in the loop as to how this young buck is tracking. The Caeneus Minerals (ASX:CAD) story is all about being in the right place at the right time. In CAD’s case, it is about getting involved in lithium exploration just as lithium takes off as marketable global commodity. Lithium is the consensus ‘metal of the future.’ It is the core component in rechargeable lithium-ion batteries that power EVs and the key to the rapid transition away from fossil fuels. We first wrote about CAD back in April 2016 in the article Up the Road from Tesla: ASX Junior Moves into USA Lithium and then followed up with a further article in July 2016: CAD to Start Lithium Drilling Near Tesla . Over the course of the year, the lithium exploration boom has maintained its lustre with lithium prices remaining elevated while lithium explorer/producer valuations remain resolute. Existing lithium producers, or explorers that are nearing producer-status, are posting significant share price gains so far this year with Americas-focused Albermarle (NYSE:ALB) and Lithium Americas (TSX: LAC) leading the charge. CAD is working towards joining the fold as soon as possible, and has therefore earmarked a substantial exploration program beginning with gravity and geological assessments that will be used to determine exploration targets. Despite the early-stage nature of CAD’s primetime Nevada assets, all the preliminary information that can be used to inference potential value is lining up in CAD’s favour. As you can see, CAD’s Projects are adjacent and tangential with existing significant lithium projects in the area including the Silver Peak mine, the Lithium Nevada deposit, the Tesla Gigafactory and a Faraday Plant currently at the planning stage. This extends to the newly acquired New King Lithium Clay Project. The map below gives you an indication of just how close the property is to Tesla’s Gigafactory. Thus the question so far isn’t whether there are ample quantities of lithium in Nevada — rather, it is a question of how much, and most importantly, how economically viable will it be to monetise. The early signs for this aspect of the lithium exploration boom are also very positive with production costs visibly falling as more lithium explorers and miners attract more extraction and processing facilities to come online. Roskill, an industrial minerals consultancy, says demand growth for lithium carbonate has grown more than 16% per year since 2012. Roskill projects demand to exceed 186,000 tonnes in 2016, reaching 325,000 tonnes by 2025. Consensus analyst estimates forecast annual lithium demand to reach 473,000 tonnes by 2030 — a 250% increase from 2016. The cost of lithium batteries has been falling extensively since 2010 with further cost optimisations expected given that lithium is still in its infancy as a global market. The cost savings illustrated above are facilitating a boom in EV car sales and pretty much anything that requires lithium batteries. Newly booming markets for electronic gadgets such as wearable devices, mobile phones and tablets now has another entirely new addressable audience: drone users. Drones are making strong headway in how popular they are, how usable they are and to whom they appeal. Originally designed for professional and military purposes, drones are now beginning to be sold as Christmas presents for children. Yet again, this could be a harbinger of another demand spike for lithium-batteries because drones tend to be very energy intensive while still remaining an early-stage consumer product with strong future sales looming. In the interview, Mr. Caldelas points out that “lithium brine opportunities offer better operational costs, better capital costs and better grade of lithium for processing and application”. Which is good news for CAD given its exploration targets in Nevada. 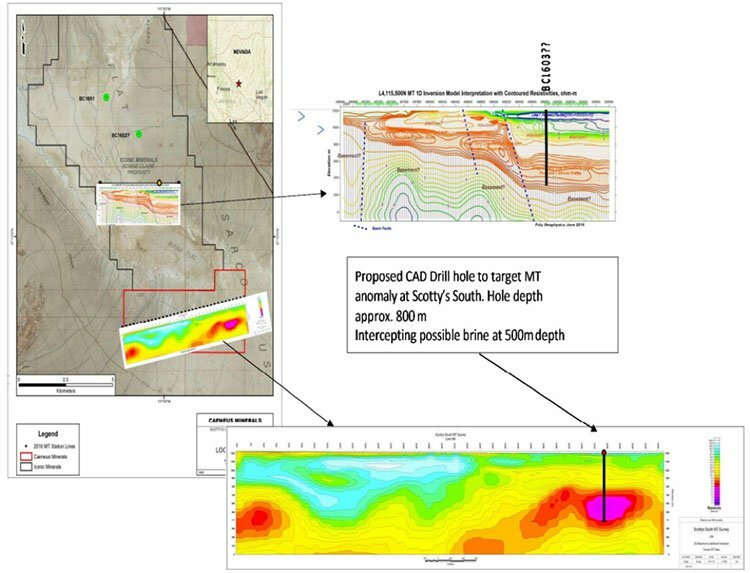 With all these opportunities in mind, there is little wonder that CAD has been on the acquisition path and has entered into a binding option agreement to acquire 100% of the issued shares of private company Nevada Clays, which own the New King Lithium Project – a potential district scale Lithium Clay Project located in the established McDermitt mining district in Northern Nevada totalling approximately 5000 acres. CAD’s New King Project neighbours Lithium America Corp’s Lithium Nevada Project, one of the largest undeveloped lithium deposits in Northern America. With a 43-101 Compliant Mineral Resource of over 300 million tonnes, measured and indicated at a greater than 0.284% Lithium or greater than 1.5% lithium carbonate equivalent across two lenses of mineralisation. New King is situated just 10km from the Lithium Nevada Project Stage One and Two lenses and even more critically lies outside the US Federal Bureau of Land Management’s sage-grouse habitat areas and other farmlands which prohibit mining. Remember, it is also only 350km from Tesla, thus there is real strategic purpose in this acquisition as you can see in the map below. 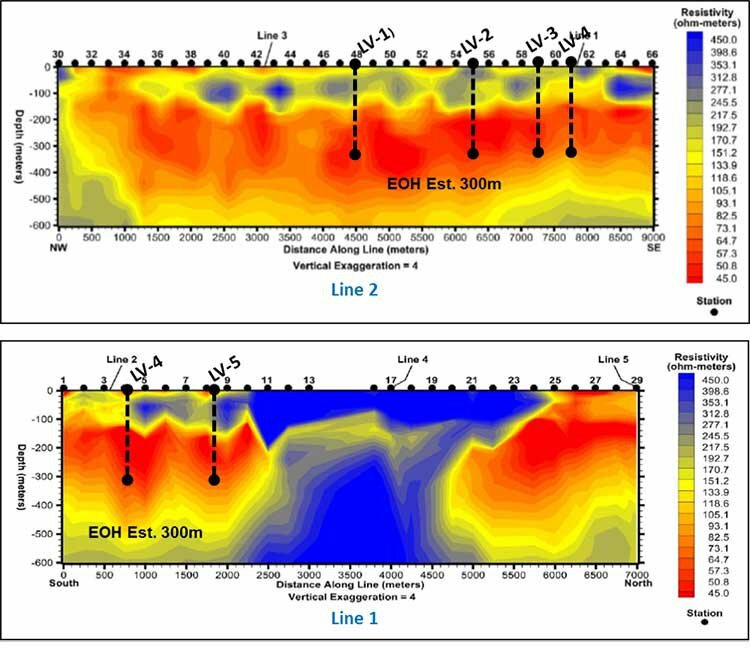 Preliminary test work will now be undertaken in the region to compile a thorough geological understanding of the region, with interpretation moat sediments as well as other lithium bounding structures from the ridge areas of the Project. This binding acquisition will nicely complement CAD’s overall play with its two clay and three brine projects all to be explored over the remainder of the year. Part of CAD’s ongoing exploration is occurring at the Muddy Mountain Lithium Clay Project . Early field work has now been conducted which confirmed elevated lithium in hosted beds. 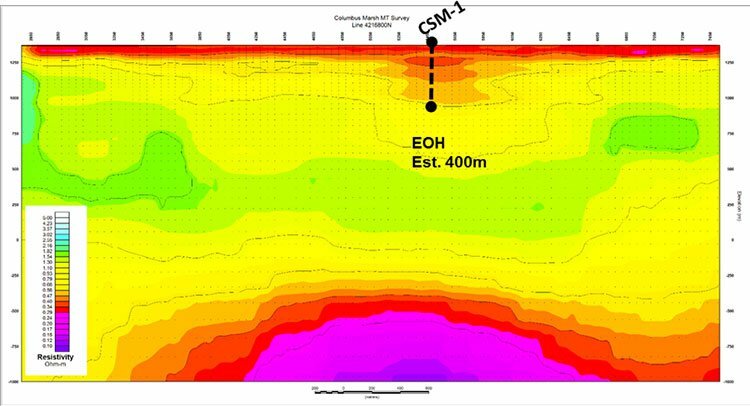 Several samples have been collected and a two-metre thick interval that averaged readings of approximately 2000ppm lithium have been identified. There are also highs within the interval of as much as 7900 ppm lithium or 4.2% Lithium Carbonate Equivalent as you can see by the picture below. 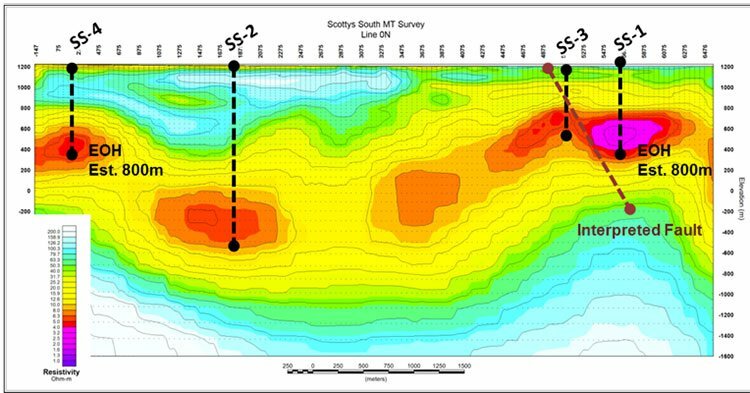 It should be noted that these are only spot readings and this grade may not be reflected on continued exploration and drilling. Investors should investigate further and act with caution if considering this information in relation to their investment decision. Confirmation of the results will be made via assay at the end of the work campaign, but early indications are that lithium is stratigraphically controlled. This is encouraging for CAD as there is the possibility of encountering large mineralised horizons at depth via drilling. The ground crew is currently in the process of mapping the entire claim area, with the next step being to advance the project through preliminary minerology of the lithium bearing minerals and confirmation of lithium mineralisation via assay. It is hoped the area contains a large tonnage lithium deposit similar to King’s Valley, Jadar or Sonora, which you can read about below. The first approach targets desert sub-basins, or playas, that exhibit similar geological and geophysical characteristics to the Clayton Valley basin, site of North Americas’ only producing lithium operation, the Silver Peak mine. Such lithium brines are known to accumulate in desert sub-basins which can be delineated by gravity surveys that detect strong gravity lows. CAD has acquired three properties in separate basins that satisfy this criteria: Lida Valley, Scotty’s South and Columbus. In its lithium clay approach, CAD is targeting ‘district scale’ lithium clay targets analogous to Lithium Americas Lithium Nevada (formerly Kings Valley) project, Jadar (Serbia, Rio Tinto) or Sanora Bacanora. CAD has identified two properties that fits this criteria: the Muddy Mountains Clay Project and the recently acquired New King Lithium Clay Project. From a strategy point of view, CAD is formulating and growing partnerships with potential end users for their commodities. The company’s projects are strategically located between the Tesla Gigafactory near Reno, Nevada where Tesla Motors and their partners have committed to up to $5 billion of investment up to 2020, and the proposed Faraday Future plant in Northern Las Vegas. To take advantage of this, CAD is looking to eventually prove up a high-grade bulky resource. This wouldn’t be out of the question as its peers in the region have managed to already define strong resources. However resource definition is still some way off for CAD and this remains an early stage, speculative investment. If considering this stock for your portfolio, you should seek professional financial advice. CAD is hoping to fulfil its lithium brine and clay opportunities and emulate the likes of Albemarle and Lithium Americas in the coming months and years, but of course it largely depends on exploration success and what its Li 2 O grades are like when assays are completed. The following valuation comparison chart, gives you an indication of where CAD sits in relation to its peers. When comparing CAD to other land holders in the region the table shows an obvious difference in valuation – CAD is much smaller. However, all five of CAD’s projects have similar attributes to their peers’ individual projects, which could put CAD in line for a re-rate especially if New King and Muddy Mountains prove to be winning projects. The lithium space is becoming a frantic game of who can get their hands on the choicest new mining ground and who can launch new production fastest. In North America, all the action is in the state of Nevada — the staging area for the US lithium boom that’s feeding the tech-manufacturing expansiveness of everything from EVs, battery Gigafactories, Powerwall’s and energy storage solutions to the long and growing list of consumer electronics that we use every day. 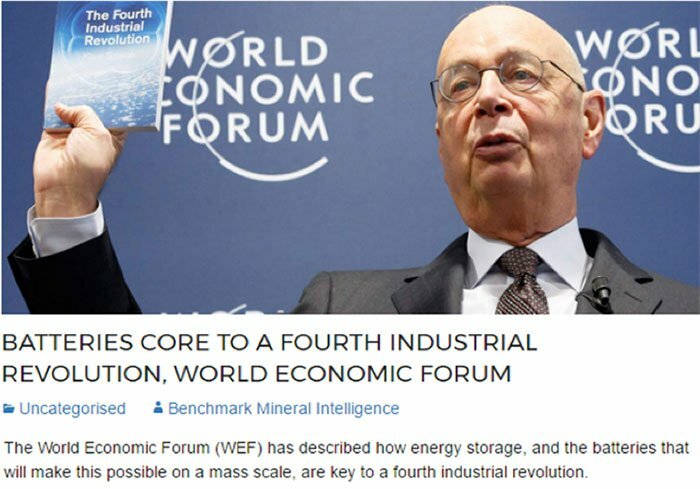 Lithium is already powering pretty much everything upon which our present depends on in the form of modern technology that makes modern society operate smoothly. With the Internet of Things promising to launch billions of more inter-connected devices at billions of consumers globally, backing the juice that makes the smoothie could be a prudent thing to do — especially at ultra-low valuations. Lithium is a viable alternative to both petrol and consumer electronics market segments alone; there is no sign of contraction — only expansion. With everything in the world going ‘smart’ these days in the form of smart houses, smart cities, smart watches and smartphones — jumping on the lithium story at the introduction stage could turn out to be a smart decisions.